Describing the game's genre as RTS vs. RPG doesn't postulate a gameplay with just certain elements of the two genres. Instead, it implies a unique, by its gist, combination of two full-fledged genres, a real-time strategy and a role-playing game. In Heroes of Annihilated Empires, it will be possible to develop the chosen hero through an RPG system, as well as to build cities, recruit armies led by the hero, as traditional for RTS games. The role-playing ingredient allows using numerous magical spells enabling your hero to withstand entire armies on his own. The strategy part provides the player with a possibility to enjoy massive battles, build up cities and create armies of many thousands of fabulous warriors. The game gives you the option either to combine these two elements or to make a choice in favor of only one. Owing to the opposition of the two genres, you'll be able to plunge deeper into the atmosphere of a distant epoch, when magical forces didn't yield to the power of gigantic armies. The plot of the single-player campaign relates to the first episode of pivotal historic changes to the world where the empires that existed then have long since been forgotten. 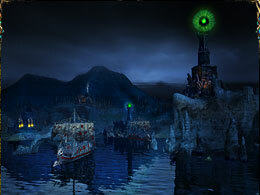 The player will take part in breathtaking events of antiquity. The possibility of unveiling the mystery of the disappearance of the ancient peoples who inhabited our planet thousands of years ago will become an important part of the game's story. Alongside the main hero, the elven forest guardian Elhant, the player will protect his folk who are suffering while being besieged by undead forces. In the course of this confrontation, the player will explore the seemingly boundless expanses of the Atlans island, carry out various quests, accumulate experience, establish relationship with fabulous races, cast impressive spells and control powerful armies consisting of colossal numbers of warriors. Network games can be enjoyed by up to seven gamers at a time over LAN or the Internet. Episode one will provide the player with four unique races to choose from, including elves, undead, ice folk and one more to be discovered later. Each race has three heroes and plenty of original units and buildings on top. Although completely different in the ways their economies and armies are built up, none of the races will possess qualitative superiority over another. Each will have its weak and strong aspects. 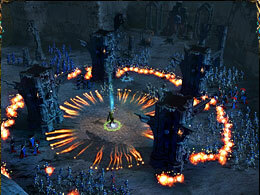 The player will be free to choose in between the RTS and RPG ways of playing. Having opted for the latter, the player will be acquiring skills, accumulating battle experience, and buying cards with spells as well as finding others on the battlefield. Through skillful use of these magic cards and with the experience/skills he has gained, the player's hero will be able to defeat enemy armies consisting of thousands of units. 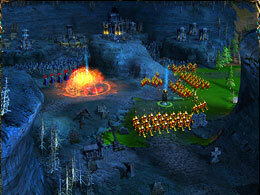 Having preferred the RTS style of play, the player will build up cities, accumulate and lead huge armies. This manner of play will provide the chance to demonstrate the player's talent as a strategist and military commander. The game will provide for an impressive number of magic spells that were borrowed from the residents of the miraculous ancient world. Using these spells, you'll be able to strike shattering blows on opposing armies, to increase the power of your warriors, to turn forces of nature against your enemy, and to resurrect the dead. The distant magical world of Heroes of Annihilated Empires will reveal plenty of mesmerizing phenomena exceeding the bounds of our consciousness. The magic spell system stands out with its simplicity of use, brilliance and seamless integration into the virtual gameworld. It is equally interesting and accessible for both newbies and veteran players. The system is magic card-based, counting over 50 spells overall. Accomplish various quests to obtain new cards, purchase them at merchants, or locate them hidden amidst battlefields. As your hero's experience grows, the spells become more effective, and some of them acquire new qualities. Skillfully combining cards won't leave your enemy a chance to win. One of the most renowned features of GSC Game World strategy releases is massive battles including the possibility for the player to lead armies of many thousands of units. In Heroes of Annihilated Empires, you will be able to control armies composed of dozens up to thousands of fantasy creatures. The technology of converting sprites to be displayed by a fully 3D engine is GSC's know-how used in the new engine for this game. Although a difficult process to undergo, the result achieved allows us to place on the battlefield gigantic 3D units alongside thousands of smaller ones, all in high detail and perfectly animated, while at the same time minimizing the computer resources consumption. As a result, the game runs smoothly and in incredible detail, even on lower-end machines. 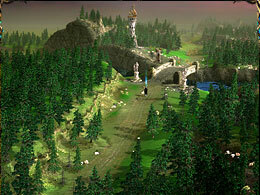 The map overview is presented with a camera position that is traditional for RTS. Gamers however, will be able to view in free camera mode by rotating the map, zooming in and out. One of the unique Heroes of Annihilated Empires engine features is a revolutionary technology of building modeling. It includes a method based on 3D models degrading. Low-polygon building models (thousands of triangles) are created based upon high- polygon models (millions of triangles), saving the quality of the latter but not consuming the machine resources required for the latter. Physical modeling of the in-game building destruction is also included. Skeletal animation allows performance associated with three-dimensional model animation in a compact and effective way as well as making for smooth transitions between different animation styles. Based on visualization with Microsoft DirectX 9 and vertex and pixel shaders support, we have created a visually realistic model of water, as well as three-dimensional and performance-effective tree models (including shaking in the wind). The engine behind Heroes of Annihilated Empires also represents innovative technologies of landscape modeling such as in-game terra-morphing and a landscape fractal generator. The former technology is based on the possibility of dynamic vertex painting (definite vertex painting means color and multi-textures are assigned to it). This feature enables changing of the landscape color scheme in real-time depending on which race possesses the territory.